and FILLED WITH ABUNDANT PLEASURE for LIFE! 2019 is the year of the Pig – the year of GOOD FORTUNE and AWESOME RESULTS of everything we have “planted” in 2018. The Year of the Pig is about birthing something new into life, something you have been preparing for for a long time. The energy of the Pig begins flowing on February 5th 2019. The sacred geometry pattern of the numbers 4 and 8 are especially beneficial. Colors of gold, yellow, brown and all shades of gray are great intention-amplifiers in 2019. Pig energy likes the 8-patterned “angled circles” (octagons). 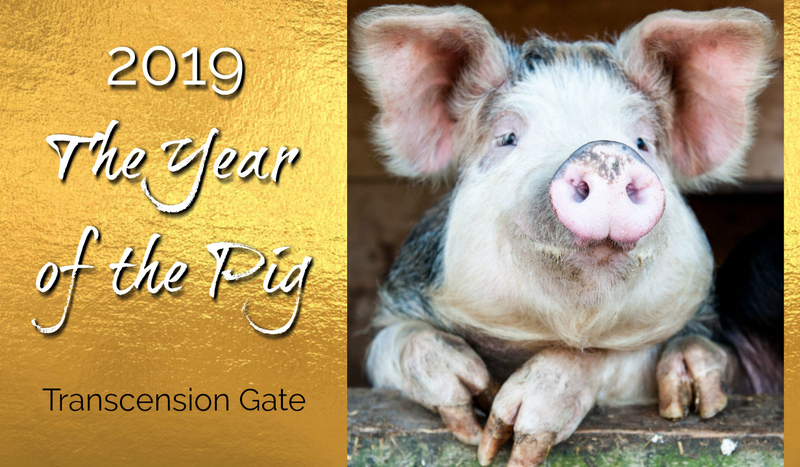 Because Pig years are very communicative, it is a great year for NEW CONNECTIONS and EXPANSION OF RELATIONSHIPS beyond your “normal” – perhaps thinking of what is possible beyond the usual for you – in a different town, state, country, internationally and MULTIDIMENSIONALLY. Pig is also governed by a “traveling Star” – it is the year of EXPANSION OF AWARENESS and EXPERIENCES BEYOND EXPECTATIONS, beyond the “box” of your usual limitations. This applies to material travel and to multidimensional travel – it is a GREAT YEAR TO TRAVEL in your body and consciousness! Pig is a “life lover” – it finds PLEASURE IN ENGAGING LIFE and BEAUTY IN EVERYTHING. This energy will be balanced with the GENTLENESS and GENEROSITY to people who have “less than you” (for example, this is the year to really learn to be compassionate to the less conscious people in your family or community). Pig is SUPER OPTIMISTIC and out of the 12 year cycle, these years are more hope-filled and life-loving than any other. But be careful to not get stuck in the “optimistic daydreaming” – it is essential to be proactive in 2019! 2019 is a year of ABUNDANCE and SUCCESS in all areas of your life. It is a great year to MAKE MONEY and to INVEST! Considering that this is such an auspicious year for a good material fortune, take advantage of the opportunity and set your goals as high as possible! As the year progresses, the first part of it is where you want to set your goals and make sure to follow through on them. There is an energy window between July and October when the synchronistic alchemy is very high, so you want to “know what you want”, what you are shooting for, so that it can magically click in during this time window. October to January (it overlaps energetically into 2020) can feel great if you are the authority on what you are involved in. If you are a part of a team and have to work with others to make something happen, you need to make it work before October 2019, because towards the winter any team-work that is goal-related will make you work much harder. 2019 will be filled with POTENT ENERGY – a buoyant current. It is a great thing for our activities and health. But… you have to watch out to CHANNEL that energy in the correct direction, otherwise this potent current will feel like an excess of charge and can lead to anxiety and insomnia. What is the “correct direction”? – anything that you set your mind to and your heart desires – i.e. TOWARDS YOUR GOALS. If we do not act (plan and follow through) in 2019, the extra energy won’t know where to go and will over-charge us. So make sure you put it to a good use! The other side of this potent energy current is that the ones of us who are electric and already action-oriented can get exhausted from too much action. So if you fall into that personality type, make sure you give yourself plenty of support along the way – like meditation, walking, exercise, good nutrition, etc. This potent energy current of 2019 can also magnetize to you people who want something from you – especially if you are a natural sparkler of Light and are compassionate and inclined to serve. So, try not to wear your “pink glasses” all the time and be a bit more realistic about people’s motives. Be optimistic but not to such an extreme that you lose your sovereignty and let others take advantage of you. Looking forward to 2019, the optimistic good-fortune Pig will celebrate life with us and expand our connectedness with each other and the Universe beyond our wildest expectations! to be PROSPEROUS, OPTIMISTIC and FILLED WITH ABUNDANT PLEASURE for LIFE! JOIN ME for the special 8-hour ENERGY TRANSMISSION on New Year’s Eve (12/31/18)! CLICK HERE to SIGNUP for the New Year’s energy transmission. so that you can have an easier time being on this planet and enjoy life more! You might feel that the days can't get any shorter, but we still haven't yet reached the Winter Solstice – the shortest day of the year. After Solstice the days will start getting longer, as we move ️forward to Spring. Winter Solstice is the shortest period of daylight and the longest night of the year. In the Northern Hemisphere this is the December solstice and in the Southern Hemisphere this is the June solstice. CLICK HERE to SIGN UP for BOTH right now and SAVE 30%! The meaning of Winter Solstice is the BIRTH OF THE SUN. The Druids used evergreen trees, holly and mistletoe, as symbols of EVERLASTING LIFE during their Winter Solstice rituals – this is the true origin of the Christmas tree. Of course, cutting down trees and putting them in their homes would have been incomprehensible, and seen as too destructive to nature. The “tree in the house” ritual began only in the 16th century in ️Germany as a “protection from evil spirits” and the wealthy class enjoyed the trees in their homes so much that it became commonplace eventually. We each have an INNER SUN – a Core Star – within us. Winter Solstice is a representation of the “virgin birth” (from the Goddess of Oneness, the Void, the Cosmic Root Substance) of the beloved divine child, the “savior” (Core Star Light) – the part of us that is the essence of God Source within, which will lead us into enlightenment. Transformation from a physical being into a spiritual being is the path of ascension. Tuning into the Core Star now, while still here in the 3D material form, is the PATH OF TRANSCENSION. Transcension is bridging the current state and the “final destination” while still having to go through the steps of awakening. 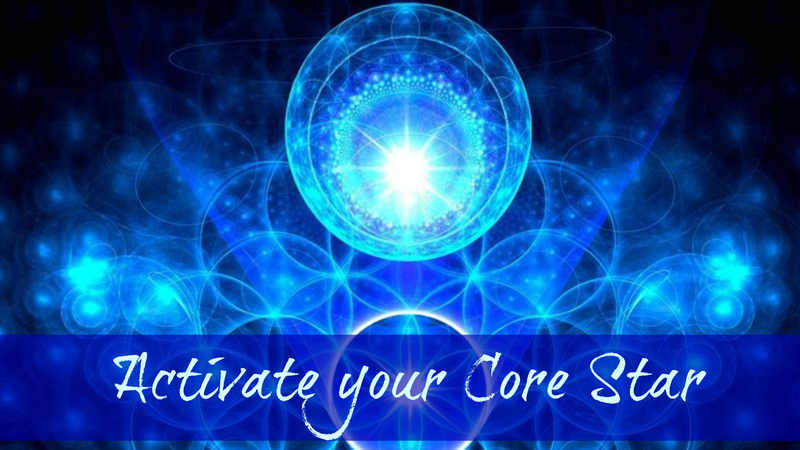 To connect to the Core Star within, we must FEEL WORTHY of our divinity! When we seek Worth from the external world, we are in Separation – the Lower 3D perception. We must stop seeking approval and acceptance from the outside world. Otherwise our negative thoughts become a dampening field of energy that slowly drowns the voice of God Source inside – so that after a while all we can hear is our own mental Lower Self chatter. You might not even think of this mental chatter as “negative” – it might seem to be the “normal thoughts about the day,” about your to-do list, about your fears and worries, your stress about not forgetting something, or not doing something right, etc. But all of this noise is related to the Lower 3D – it is based on the Separation view of reality. We become what we focus on! If one focuses on the “normal thoughts about the day” all of the time, one BECOMES this reality – becomes one’s own fears, worries, to-do lists, and stress. This is how we become trapped in the Lower 3D! We take it seriously; we do not question the validity of this perception because everyone around us lives like this. because you are an integral HOLOGRAPHIC COMPONENT of it. Or CLICK HERE to SIGN UP for BOTH (Solstice & New Year’s Eve) and SAVE $20!